This entry was posted in Blogpost and tagged brexit, Dail eireann, Seanad, united ireland on March 11, 2017 by brianmlucey. I have no doubt that a properly functioning and elected second house is a useful thing in a democracy. But one has to wonder about the mindset that treats the second house as a parachute. This entry was posted in Blogpost and tagged economy, Seanad, taoiseach on May 28, 2016 by brianmlucey. Its strange to find oneself on the same side of a political argument as Fianna Fail. That’s now where I find myself with regard to the referendum to abolish the Seanad. As an exercise in sheer political cynicism this referendum is hard to beat. Conceived by all accounts in a rush of political blood to the head to fill an empty season it sees parties engaging in volte face after volt face, playing ducks and drakes with the constitution for momentary political gain. Fianna Fail say no to abolition. 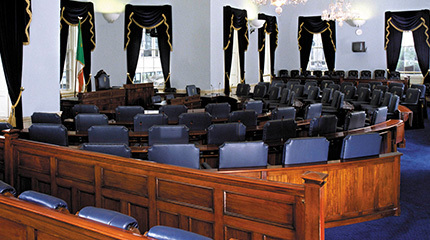 Having been in power since approximately the Jurassic period, they have over the years stuffed the Seanad with more political dinosaurs than one would find in a box set of Jurassic park but they now profess a desire for reform. Sinn Fein were in favour of reform but are now against. I think. Labour were also in favour of reform as late as 2009 producing a good piece on how this could be achieved. There are many many reasons to abolish the Seanad. Forget the money for a moment – a working democracy requires politicians who can live on the wage, and who are well supported in terms of administrative and other capacity. Nobody seems to know how much it costs nor how much abolition will save. Then there are the bakers dozen that the Taoiseach de Jure can appoint. Three words suffice to show how this works – Senator Eoghan Harris. But then there is Katherine Zappone. It’s a rotten borough – leaving aside the university senators (and successive governments of all hues have refused to implement the 40 y old constitutional amendment to allow all graduates to vote leaving that franchise even more stunted and still the most representative) and the taoiseachs nominees, they are elected by panels of county coucillors and a hodgepodge of other bodies on “panels”. See the bottom of the page for a list. A rotten borough however should not in and of itself preclude either the election of good people nor the abandonment of the idea of elections. Reform the electorate is an alternative to abolishing the election. The main reason though, apart from the fact that abolishing it would concentrate even more power legally as well as factually in the hands of the cabinet (the Dail being as dead a letter as the Seanad when it comes to holding said cabinet to account) , the Government seem not to be convinced. They refuse to put forward the man who thought this up, An Taoiseach, to debate. This is either an arrogant belief that it doesnt merit debate, or a feeling that the grounds given are sufficiently weak that even Michael Martin might shred them. So, i’m thinking of voting to retain – that way we can at least debate reform having told the government we don’t want to be bounced into this. If the system is irreformable, then fine. But lets try first. This entry was posted in Blogpost and tagged economy, elections, reform, Seanad on September 28, 2013 by brianmlucey. Catherine Murphy, Article 27 and the Seanad. One of the things that must most irk senators and dail members is the way that debates get guillotined. Catherine Murphy TD had proposed to table some amendments in the debate on the Seanad abolition bill, mainly on the issue of Article 27. That this would be futile, as no opposition or independent amendments, no matter how worthy or how much the government agree with them are ever supported. In any case the blade fell and her views were not placed on the record of the house. Nonetheless, these points that she makes are useful , and show a mechanism to preserve the democratic right of elected officials (local authority members to replace senators) to petition the president on a matter of importance. Her full document is here. Note : Im not a ‘supporter’ of Murphy, although she does seem a sensible and coherent independent. She is in my constituency, and I did give her a high preference last time out. This entry was posted in Blogpost and tagged constituency, independent, local authority, politics, Referendum, Seanad on July 25, 2013 by brianmlucey. Therefore, abolishing the Seanad has the consequence that there will be NO check on the parliament other than the President deciding on their own behalf to refer a bill to the Supreme Court. A27-1 has never been used. That doesn’t mean that its not useful to have. A properly representative and reformed upper house might have decided that one of the bills around the bank guarantee and recapitalisation might be worth getting the views of the people on, as an example. As it is we have the Economic Management Council, the Gang of 4, dominate the cabinet, which in turn dominates the government which in its turn renders the Dail, the lower house, a rubber stamp. We arguably need better oversight. We have a mechanism that in theory can be used. Im not sure that its wise to throw this out. This entry was posted in Blogpost and tagged economy, politics, Seanad on July 24, 2013 by brianmlucey.